Our annual event rewards employee workplace satisfaction. Sign up here to receive information about how to register for future 100 Best surveys. Media firm analyzed over 66,000 online reviews to determine the best destinations in Oregon based on customer satisfaction. Highlights from our tenth annual 100 Best Green Workplaces in Oregon awards luncheon. 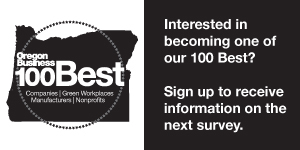 In 1994, the same year Netscape Communications launched the first commercially available web browser, Oregon Business debuted the 100 Best companies to work for in Oregon, a landmark tool for measuring workplace satisfaction in Oregon. Our latest issue features stories about the 100 Best Companies' 25th anniversary, Rep. Knute Buehler, new tribal enterprises and more.